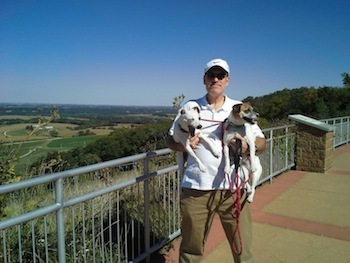 This is a picture of my two dogs and I at the Balltown overlook on a recent Sunday afternoon. The dog with the white head who is yawning is Bub, and the dog with the brown head that is panting is Moose. You can find another picture of Bub here where he helped illustrate a blog post about Iowa work comp cases involving intoxication. I think it would be very hard to get Bub to bite you. Moose is also a very nice dog. However, she got the name Moose because she became the leader of all of her litter mates, and she was actually one of the smaller dogs in the litter. (Moose and Bub are siblings, and Bub has been taking orders from Moose for every day of his 8 ½ years on this Earth). Moose is also fairly territorial. I think there is a small chance that Moose would bite a person if she felt she was in danger. There are plenty of dogs like Moose that will bite a person if circumstances come together in the wrong way. Additionally, if some dogs are around small children with food, the dogs will bite the children as part of trying to get the food away from the children. Unfortunately, in these situations children frequently get bitten in the face. I never leave my dogs unattended for even a moment around small children with food. In Iowa the owner of a dog is responsible for all injuries caused by the dog biting a person. This includes medical bills, lost wages, pain and suffering, and scarring. Some states have what is called a “one-bite” rule. This means that a dog basically gets one free bite of a person, and the dog owner is not responsible for that first bite. Iowa does not follow this “one-bite” rule. Therefore, it doesn’t matter if the dog has been the sweetest animal in the world and has never shown any hint that it might bite a person. In Iowa the dog owner is responsible for the first bite and every bite of the dog, whether the dog is the nicest dog or meanest dog in town. Under Iowa law the only situation in which an owner is not liable for damages caused by the dog is, “. . . when the party damaged is doing an unlawful act, directly contributing to the injury.” See Iowa Code Section 351.28. There are not any Iowa appellate cases that clarify exactly what qualifies as an unlawful act. A burglar who is bitten by the homeowner’s dog probably is not going to be able to collect damages. A Girl Scout coming to the front door to try to sell cookies might arguably be trespassing, but I think the Girl Scout is going to be able to win the case if the homeowner’s dog bites her. The owner of the dog is the person that is liable for any damages caused by the dog. Sometimes after a dog bite, people that seem to be the owner will start to argue that someone else actually owns the dog and they were just watching the dog for a limited period of time. Determining who actually owns the dog does not require showing that someone is actually the registered owner of the animal. Dog ownership can be established by showing that the defendant had possession of the dog and was harboring it on his premises in the manner that dog owners usually do. Fortunately, most dog incidents do not cause serious injury. However, if you or a family member are seriously injured by a dog bite you should definitely consult with an experienced Iowa personal injury lawyer.